However, Givi gear doesn’t come cheap. So for Mary’s CBF500 I set about sourcing stuff second hand. 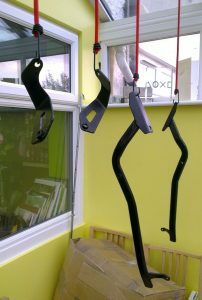 I managed to pick up a set of Givi 260FZ rack arms on ebay for £20. Note the same arms fit the CBF 500, 600 & 1000, so extend your ebay search accordingly. They needed a lick of Hammerite to tart them up, and although they came with the required spacers, were missing some bolts and washers. 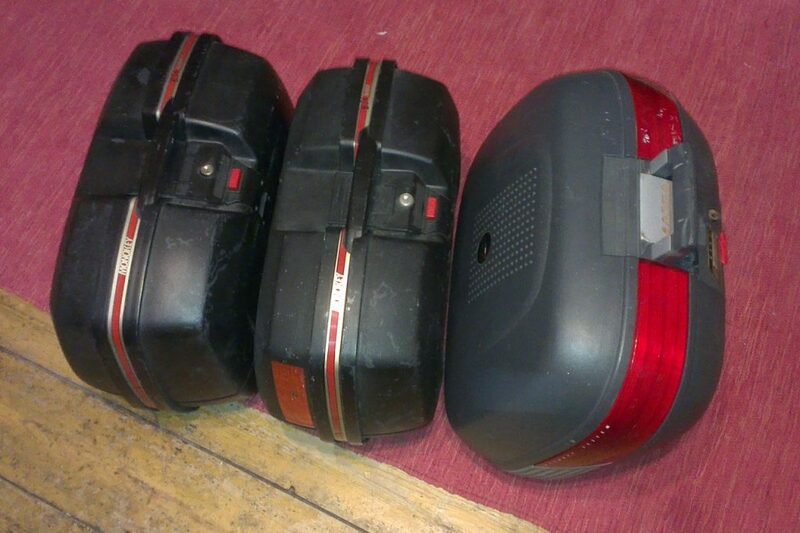 However these are all standard M8 size, and I happened to have some spare from old crash damaged racks off my Fazer. Normally these arms sell for ~£60 (Buy from SportsBikeShop). 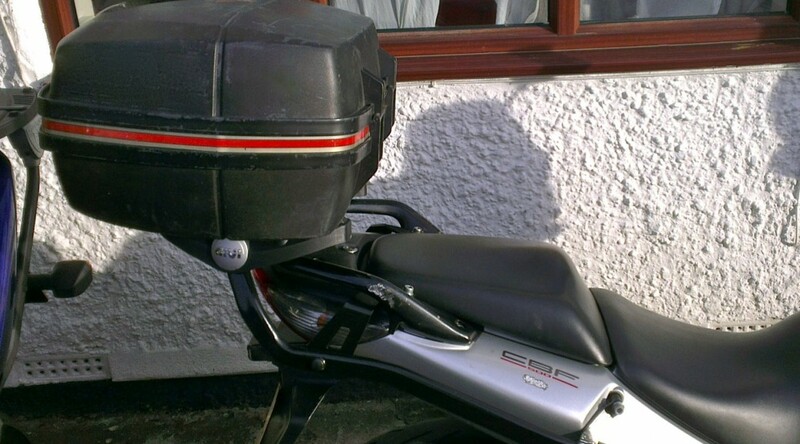 Instructions with a details of all parts required can be found on Givi website. Next up I needed an ‘M5’ plate to attach to the rack. Note this is the Monokey variant that is sturdier and can carry more weight and bigger boxes, as opposed to the less robust M5M Monolock plate. On ebay these plates were thin on the ground, often no cheaper than new and/or missing fitment bolts. 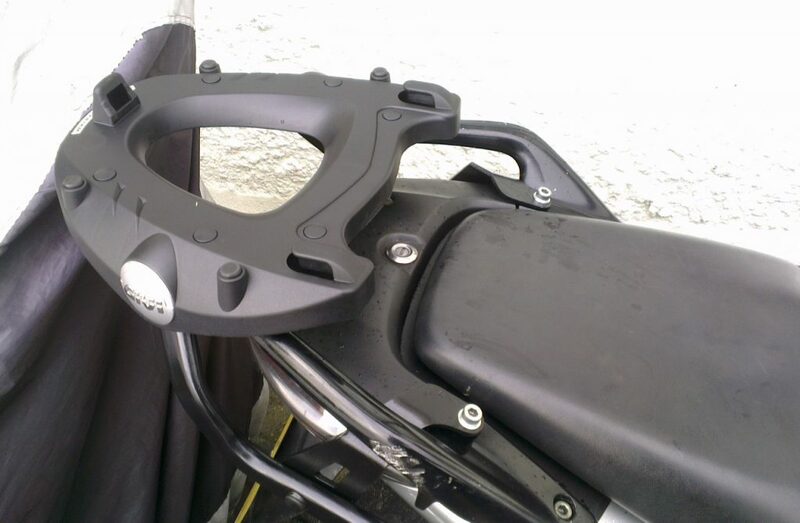 As such I opted to purchasing from SportsBikeShop the M5 Givi plate who had them discounted at £35 delivered. Fitting was a breeze and just entailed removing four bolts from rear of the CBF500 and replacing them with the longer Givi bolts. Lastly, I just had to source a top box. Brand new, these aren’t cheap with the heavy duty Monokey boxes starting at around £170. Back to ebay it was. With a stroke of luck I found a seller listing three boxes with very poor titles and descriptions, completely omitting the name Givi! They needed collecting and were located around an hour drive away, but nonetheless I stuck a low bid in and blagged all three for £50! Two old E36 boxes and a larger Maxia 52ltr box. A little shabby, but undamaged and including keys. Sorted! The smaller E36 boxes had been used as side panniers, but all use the same interchangeable Monokey fitting, so we can switch between a smaller or large top box depending on what we’re carrying. So there you have it, with a little hunting around and patience you don’t need to spend a fortune to add hard luggage to your bike.